office design Archives - reSAWN TIMBER co.
With simple, subtle color notes, Osprey Software wanted a wood with a natural color and enhanced grain. reSAWN’s REED features antique reclaimed hemlock that is wire brushed to accentuate the unique grain pattern of hemlock. Specified for ceiling cladding and wall cladding, REED can be found in reSAWN’s enCORE collection. The enCORE collection is made up entirely of different reclaimed wood species that include heart pine, oak, barn siding, chestnut, hemlock, and hickory. With a design aesthetic that includes dark and light grey colors, the natural coloring of the REED feature wall truly stands out. Hemlock’s unique grain pattern becomes very clear with the overhead, track lighting. WEATHERWORN reclaimed barn siding bench. The Broad Institute of MIT and Harvard is well regarded for their collaborated work spaces, and incorporated reSAWN’s skip planed, reclaimed red and white oak table into their office space. Side view of the reclaimed red and white oak table at The Broad Institute. Located a few blocks away from the White House in downtown Washington, DC, this Nixon Peabody, LLP. location features reSAWN’s FSC ® certified Rift and Quarter Sawn Select Grade White Oak flooring. With a modern design aesthetic that focuses on open floor plans and communal work spaces, the architect, Perkins+ Will, specified the FSC ® certified Rift and Quarter Sawn White Oak flooring as a beautiful, naturally colored design feature that is also sustainable. Our PLATEAU collection promotes the natural color and beauty of domestic rift and quarter sawn white oak. All of the PLATEAU collection designs are available as FSC ® certified. RSTco. worked closely with Gensler Philadelphia to assist in and execute the design of this farm table for the break room for Verdis Investment Management in West Conshohocken, PA. The table top and matching base is made from locally sourced North American White Oak finished with a 100% VOC-FREE hardwax oil. reSAWN TIMBER co. also created a custom white finish on select grade cypress for 3 feature walls in this space. Gensler is widely recognized as the world’s leading collaborative design firm, not just the largest. The ability to work together as an integrated team is part of their DNA, and they have embraced it at every level, from their Co-CEOs to their studios and project teams. Showstopping, fully customizable staircases are this Italian maker Rizzi Stair‘s forte. Exhibit A: Scaloro, designed by architect Carlo Caretta. The self-supporting single helix can be specified in diameters ranging from 43 1/4 to 118 inches. See the slideshow for the full set of recent building products that captured the Interior Design editors’ full attention. All products have also been featured in Interior Design’s Fall Market Tabloid. Learn more about reSAWN’ shou sugi ban charred wood. 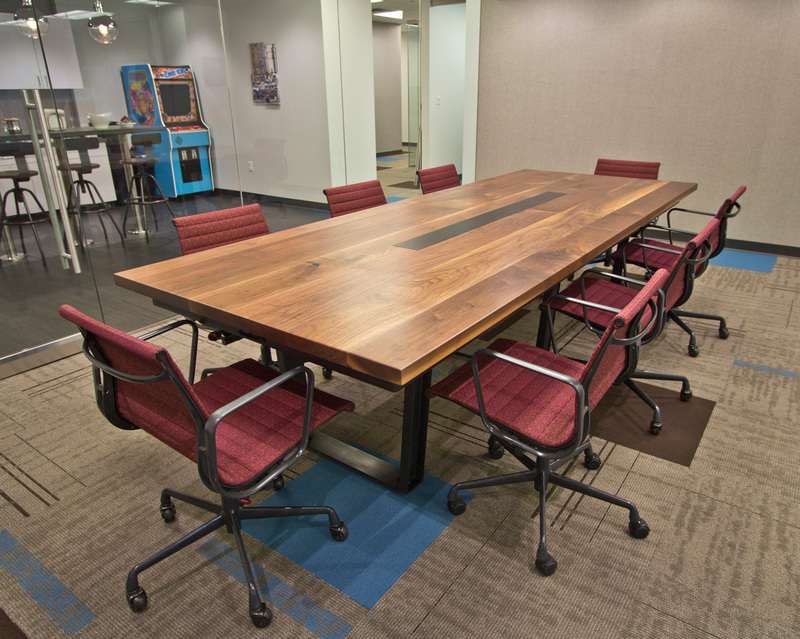 MISSION IMPOSSIBLE: Black Walnut Conference Room Table by RSTco. RSTco. worked closely with the partners of Fisher Grey Studio to customize this conference room table for MissionStaff in Philadelphia. The table top is made from locally sourced North American Black Walnut finished with a clear conversion varnish. The base is blacked steel by RSTco. and incorporates a steel apron and with power receptacles. Fisher Grey is a boutique interior design studio based in Philadelphia, owned and operated by partners Josh Thibault and Gregg Krantz. With a warm modern aesthetic and a focus on full-scale home remodeling, Fisher Grey offers committed personal involvement from concept to completion. Josh and Gregg each have over fifteen years of experience in the design and fine art industries, bringing a wide range of local, national and international resources to each project. 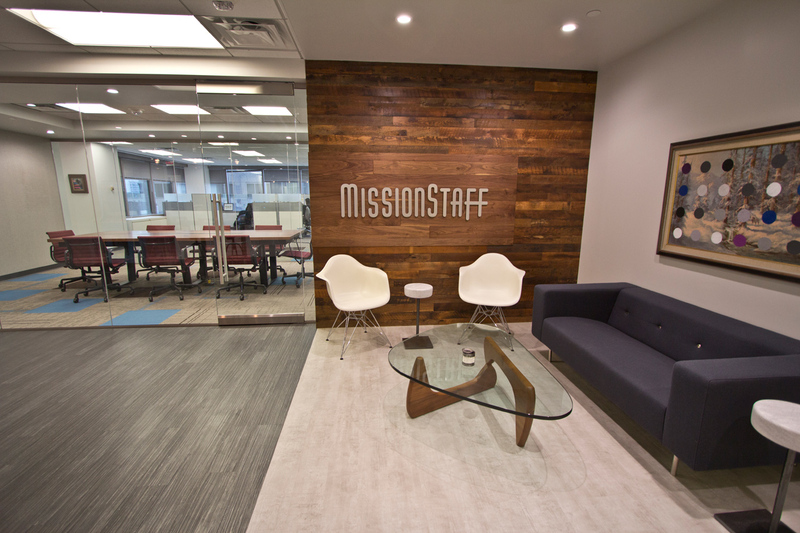 Founded in 2003, MissionStaff has quickly established itself as a trusted provider of temporary IT and Creative talent to corporate clients nationwide. With offices in Philadelphia, PA, East Brunswick, NJ and Brooklyn NY, they serve clients both locally and with a national footprint. 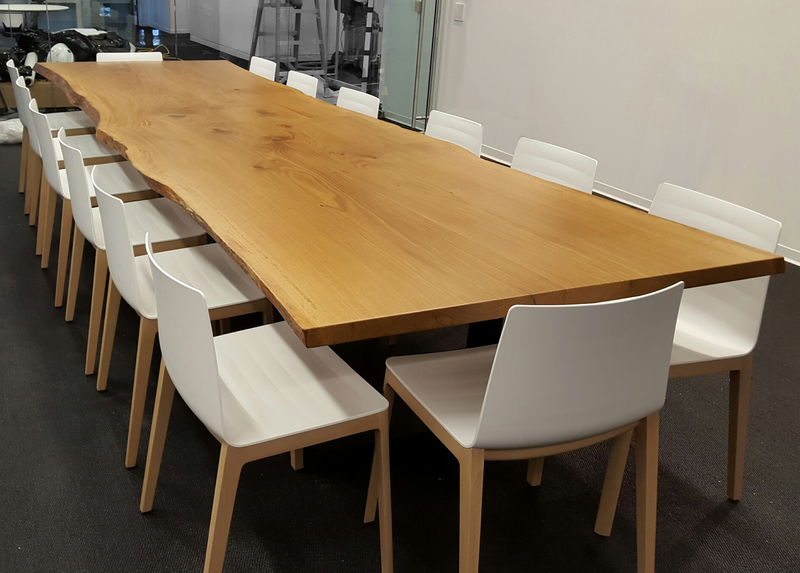 Recently installed at corporate headquarters for confidential client, this beautiful conference table by RSTco. features North American White Oak bookmatched slabs with live edge and matte conversion varnish finish. Bookmatching is the practice of matching two wood slabs so that adjoining surfaces mirror each other, giving the impression of an opened book. All RSTco. furniture is custom built and finished in our woodshop from locally sourced and sustainably harvested wood species. we prefer and specialize in solid wood construction as well as using traditionally joinery wherever possible. we offer a variety of finishes that are both durable and complimentary to the wood. other media in addition to wood are often incorporated into designs such as steel. Visit our FURNITURE page for inspiration and then contact us to discuss your project needs. CBT specified reSAWN’s STEAMBOAT wide plank character grade white oak flooring throughout this Boston law firm’s offices. STEAMBOAT is part of the RUSTIC MODERN collection which features uniquely prefinished character grade woods for flooring, wall cladding and ceiling cladding. all Launch Workplaces are hybrid workspace centers that offer flexible and affordable choices of private offices and open coworking areas, conference rooms, and comfortably furnished lounge areas. Launch Workplaces members enjoy the freedom to right-size into space as business needs change. Within a shared business community, we help independent workers, entrepreneurs, and all businesses thrive. GTM Architects – an award-winning residential and commercial architecture firm serving clients in the Washington DC area and nationwide – specified our WEATHERWORN reclaimed barn siding for this project.